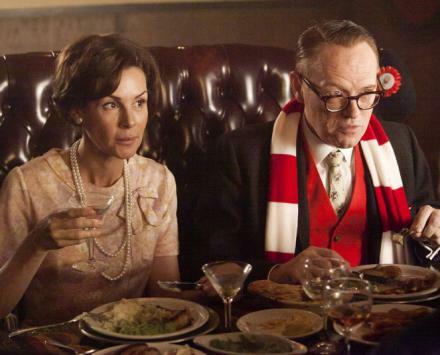 "Mad Men" Review: "Signal 30" (Season 5 Episode 5) - "You want some more, Mr. Toad?" 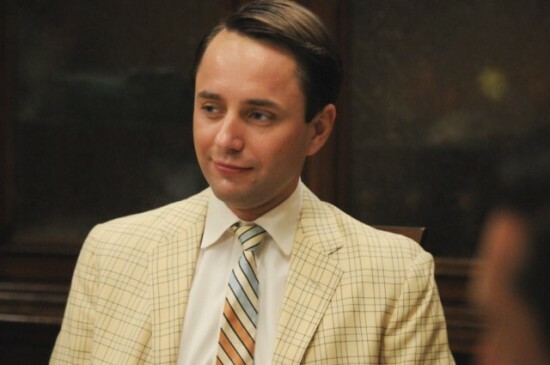 Vincent Kartheiser at Pete Campbell on "Mad Men"
The long-awaited fifth season of Mad Men continues, and I’m reviewing and analyzing every episode as it airs! Tonight, we’re taking an in-depth look at the season’s fifth hour – and one of my absolute favorite Mad Men episodes of all time – “Signal 30.” To give the hour a proper analysis, this review contains heavy spoilers, so don’t read unless you’ve seen the episode. Spoilers for “Signal 30” after the jump…. That may be the biggest lie anyone on this show has ever told. If Roger were correct, then the lives of our characters would be significantly different. For starters, Don Draper would have dealt with the angst of his first marriage by simply being his brilliant ad-man self, rather than sleeping around, and Roger himself wouldn’t have solved a mid-life crisis by abandoning his family to marry a 20-year-old woman. Whatever Roger remembers, it’s a falsehood, and the evidence lies in the three characters at the center of “Signal 30:” Lane, Ken, and especially Pete, all of whom have reached the limits of how much professional satisfaction can satiate them. Each character feels powerless, and tonight’s episode chronicled the steps they’ll take to stake out even a modicum of authority. It’s no coincidence that Roger states his platitude while staring Ken Cosgrove in the face. Ken is probably the most well adjusted person working at Sterling Cooper Draper Pryce, and that’s reflected in the clever way he deals with feelings of dissatisfaction: he takes a pen name and he writes, using the power of storytelling to make sense of a nonsensical world. It’s his own personal escape, a healthy way to fill whatever voids he may be experiencing, the lone forum he can retreat to and feel powerful. As long as he has his stories, he has enough to feel content, so it’s no wonder he feels on edge when Cynthia tells his co-workers about ‘Ben Hargrove:’ if that name gets out, he looses the safety of his one personal shelter. When Roger tells him to stop writing, Ken looks as if he’s getting a death sentence; in some ways, he is. Roger is taking away his one source of power in the world. But just to prove, once again, what a mentally sound person Ken Cosgrove is, he doesn’t try to reclaim that power through drinking, posturing, or philandering; he simply returns home, climbs in bed with his wife, creates ‘Dave Algonquin,’ and goes on with his life. Pete and Lane – along with nearly every other character in Mad Men – could learn an awful lot from Ken Cosgrove. It’s impossible for Pete to put a finger on what’s missing in his life, just as he can’t figure out why the faucet is dripping in his house. But whatever the problem is, the water keeps on dripping, Pete can’t ignore the sound, and no amount of tinkering can make it go away. Whether he’s conscious of it or not, Pete wants to feel power, and he’s not finding it at work or at home. So he begins searching wherever he can, starting with the reasonable idea of learning how to drive and growing increasingly desperate and pathetic from there. He brings Don, Ken, and their wives over to his home to show off his fancy stereo, but when the faucet snaps completely – giving Pete the chance he so desired to be a ‘man’ – Don steps in and saves the day before Pete can unpack the toolbox. So Pete resorts to wooing the young girl in his driver’s-ed class, someone who can look up to Pete and make him feel powerful. But a tall, toned teenager – literally nicknamed ‘handsome’ – steps in to steal the girl’s affection, and Pete’s back at square one. Thus we reach what may be Pete’s most pathetic and heartbreaking moment: drunkenly receiving pre-coital words of encouragement from a prostitute. She runs through several scenarios trying to satisfy him, but he rejects all of them before she says: “You’re my king.” That’s the best he can get, the most powerful he can feel, so he settles for it. To my mind, that’s the moment when Pete hits rock bottom. The beating from Lane isn’t nearly as depressing: it’s just the moment when Pete finally realizes what we’ve seen all along. If Matthew Weiner tried giving Pete this story even two seasons ago, it would have fallen flat on its face as a case of an unsympathetic character doing despicable things. But it’s a testament to the power of the writing and Vincent Kartheiser’s increasingly excellent performance that by the time Pete declares “I have nothing,” my heart genuinely went out to him. Nothing excuses Pete’s behavior throughout this episode, especially cheating on his loving wife, but to judge Pete, one would have to deny the poignant human truth at the heart of his story: that sometimes, even if every part of one’s life seems perfect, it’s possible to feel isolated and helpless, and those feelings can drive us to do terrible things. Sadly, most of us aren’t as flawless as Ken Cosgrove, and the beauty of Mad Men is that it allows us to revel in the imperfections of humanity. There’s an unsettling catharsis to Pete’s story, because no matter how high and mighty viewers may try to be, we’ve all felt like Pete at one point or another. In that sense, Don serves as an audience proxy; he knows exactly what Pete’s going through, because he’s made all the same mistakes himself, and though he never says anything, it’s clear – from the look on his face at the high-end brothel to the way he holds the elevator for Pete – that Don would much rather help Pete instead of judging him. There’s a real danger now that Pete is walking Don’s path, and though Don has found happiness, he – and the audience – would rather not watch Pete traverse the same rocky path to get there, hurting many people along the way. Lane, meanwhile, is even closer to a breakdown than Pete is, which comes as no surprise when one considers how much the character has been through over the last few years. As the opening scenes remind us, Lane is a good man caught between two cultures, one that accepts him for who he is and one where he has to fight tooth-and-nail to get an ounce of respect. If any character should feel powerless on this show, it’s Lane. His outburst at the partners for loosing the Jaguar account has been a long time coming, and the only reason it’s Pete – not Roger – who gets caught in the crosshairs is because Pete’s current mindset makes him see this as an opportunity to feel and act superior. 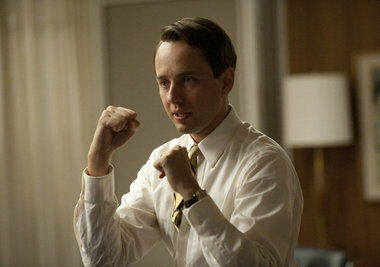 So they fight – in one of the most unpredictable and satisfying scenes Mad Men has ever pulled off – and Pete goes down for the count. It doesn’t make Lane feel any better, of course – I wouldn’t take his threat to resign too lightly after all this – and Joan gives him some words of wisdom: “If they’ve tried to make you feel different than them, you are. That’s a good way to be.” It goes back to the core recurring theme of the season, that SCDP may be a toxic environment that makes talented people do terribly self-destructive things. With that theme in mind, tonight was the most insightful hour of the season, and one of my all-time favorite Mad Men episodes to date. Under the splendid, playful direction of John Slattery – Roger Sterling himself – every second of “Signal 30” simply burst with liveliness and verve. The cast’s chemistry was at its absolute best, every scene was staged to perfection, and though this review has focused on the downtrodden subtext, the hour was riotously funny. Just look at Trudy’s dinner party and everything leading up to it: the writing and direction somehow turned the supremely serious Don into the brunt of a fantastic joke – how much effort it takes others to get him to have fun – with other character-based gags layered on top (Don and Megan continually forgetting Cynthia’s name was simply wonderful). But once Ken’s alter-ego came out, the sequence slowly started shifting into more serious territory; secrets started dropping like flies – even Don opened up to talk about life on the farm – and the characters bounced off each other in the most meaningful of ways. Throughout, the pacing and editing just snapped like fireworks, without ever selling the most serious moments short. Between this and the two episodes Slattery directed last season, I have no qualms in saying he’s my favorite director the series has ever had. To be honest, I was unsure if Mad Men could ever live up to the awe-inspiring high points it established last season; but five hours into the new year, the series is on an absolute roll, and even though the characters continue to struggle with chronic dissatisfaction, I couldn’t possibly be happier with what we’ve gotten thus far.